For the longest time I have wanted a new monitor, one that preferably is equipped to handle the rigours of gaming at a high level. Not high level in the sense that I’ll be running dual Nvidia RTX 2080 Ti cards and praising Gabe Newell before I go to bed each night, but one that provides me with all the bells and whistles should I ever wish to unlock the full potential of my Nvidia GeForce GTX 1070. For context: over the past couple of years I’ve been rocking a 25” HP IPS monitor, which is a great screen if you’re just doing the basics and the odd bit of gaming, but it’s not the bee’s knees. I’d been toying with the idea of buying a ‘gaming’ monitor for some time now, but I could never tick all the boxes: price, size and features. So when BenQ offered me the opportunity to take the EX3203R monitor for a spin, I took it with both hands (and eyes). 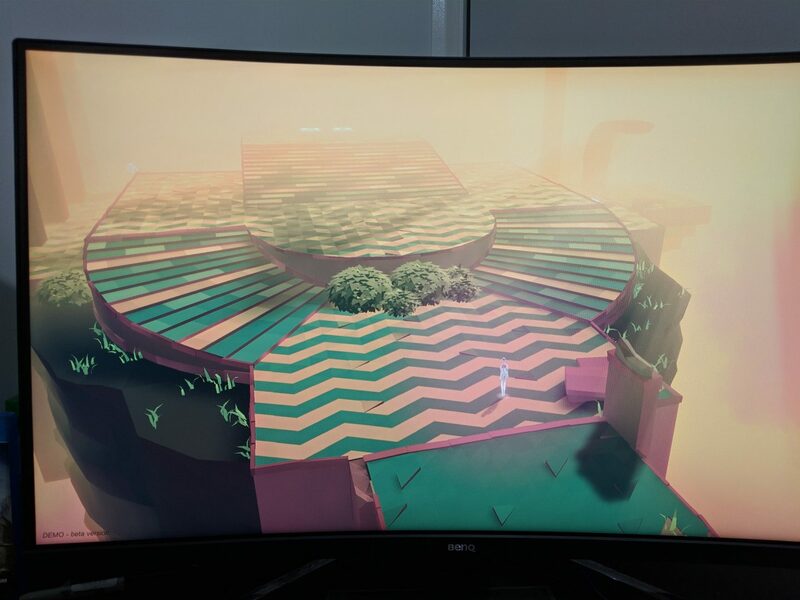 The majority of my gaming is played on consoles – on a gorgeous LG 4K 55” OLED TV. Games look slicker than Joseph Gordon-Levitt’s hair in Don Jon on it, and as I start to gravitate more and more to PC gaming, I find myself pining for a similar visual experience. Sometimes I’ll get out the five-metre HDMI cord and plug my PC into my TV, but I want something permanent for my desk; something that can be used for both gaming as well as the day-to-day basics. The BenQ EX3203R is a 32” height-adjustable curved gaming monitor laden with features. Boasting a 2560×1440 resolution (QHD – Quad HDQ) on a VA panel, the EX3203R supports HDR10, AMD FreeSync 2, 144Hz refresh rate, USB Type-C connectivity, an exclusive feature called Brightness Intelligence Plus technology which automatically adjusts the screen brightness and colour temperature based on your environment, and more. Click here for a full list of specifications. Setting it up was like any other monitor: connect the base to the monitor and plug everything in. Included in the box were the usual suspects (power cable, HDMI cable, warranty information), as well as a USB Type-C and Mini DisplayPort to DisplayPort cables. From a design perspective the monitor looks the part. Too many monitors spoil their design with glossy chassis that look cheap and scratch easy. The EX3203R features an edge-to-edge screen with only a minimal matte black pane displaying the BenQ logo at the bottom of the unit. Chrome feet and a matte silver back make up the rest of the aesthetics, with the buttons based under the right-hand side of the screen. The screen does also support VESA mounting via an optional Special Transfer Kit. 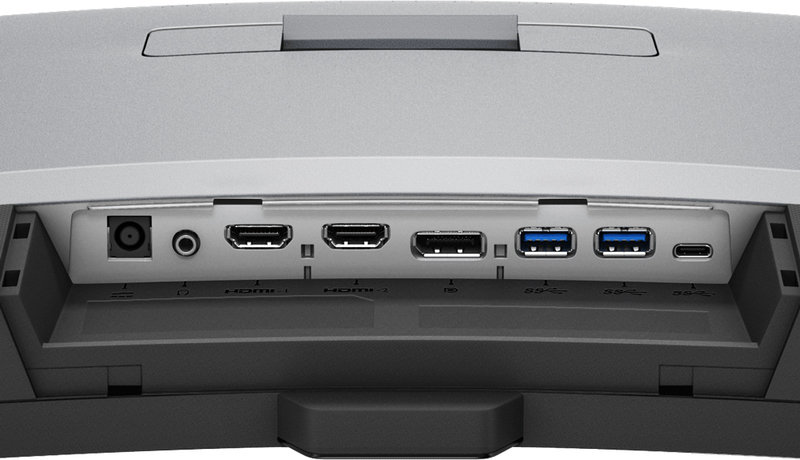 Input-wise there are dual HDMI inputs, one DisplayPort, one USB C port, one 3.5mm port for speakers or headphones and dual USB A ports for mice and keyboards and other peripherals. The inputs can be covered up with a guard that comes with the screen should you wish. Navigating the menu is simple enough with three different setting tabs for display preferences, where users can change settings (such as brightness) and enable features and pre-set monitor profiles. There are also tabs for audio and one for system settings. It is worth noting that using an HDMI connection you will only be able to utilise a 100Hz refresh rate at the monitor’s QHD resolution, while 144Hz will be available at a 1080p resolution. 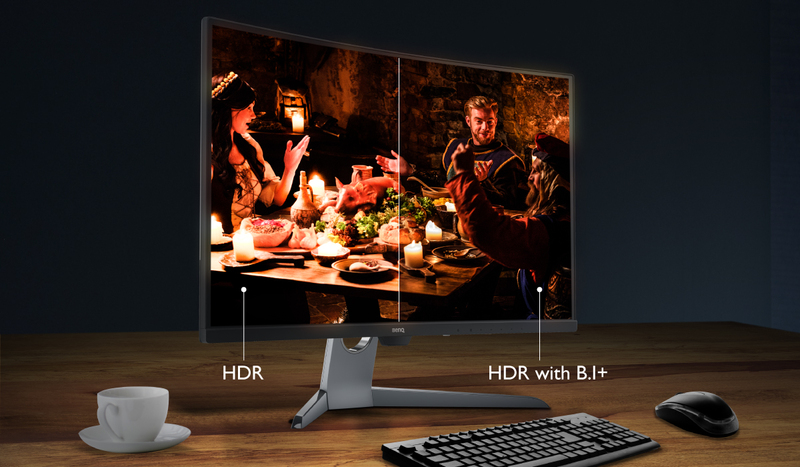 In order to make the most of the specs and get the smooth 144Hz at QHD you’ll need to use a DisplayPort cable, which annoyingly doesn’t come in the box. The first hurdle for me was how was I going to adapt to a curved screen? After all, I’d always considered it to be a gimmick of sorts, not that I had ever owned one. The screen specs listed a 1800R curvature rating, meaning the maximum recommended viewing distance is 1.8 metres. I sit roughly 70cm from my screen, so it was going to be interesting to see how the bigger monitor was going to affect my viewing and computing experience. Surprisingly, aside from being bigger, the curved aspect took next to no time to get used to. In fact, after playing a number of games there were a few instances where I felt fully immersed in the experience. These mostly took place at night, given the area where my desk is located cops a fair amount of afternoon sun – something which Melbourne hasn’t been lacking in recent times. Perhaps the game that stood out the most was the preview build for A Plague Tale: Innocence (you can read the full preview here). The image quality was excellent, with environments, characters and thousands of rats standing out with incredible detail. The monitor’s Brightness Intelligence Plus technology (BI+) worked a charm at night, ensuring visuals were striking but not tiring to the eye even at close distance, which is something long periods staring at my LG TV is prone to do despite being further away. While I wasn’t able to get games to maximise the screen’s 144Hz feature in-game (due to my graphics cards limitations) in the AAA games I played (such as Apex Legends), the few times I was privy to 144Hz were a treat. Indie games such as Damsel were smoother than 21-year-old single malt scotch, while general Windows operation and web surfing felt great. Colours also look incredibly vibrant and accurate. I got the chance to play through preview builds for Etherborn and Dead Static Drive, both of which are extremely colourful and utilise unique art styles. Etherborn’s brighter colours in particular glowed beautifully, creating a vivid backdrop that captures the player’s attention, while Dead Static Drive’s bolder earth tones were just as eye-catching. In order to test the monitor fully I decided to take the Xbox One X for a spin with it given the console supports FreeSync 2 and a 120Hz refresh rate (although it’s limited to 1080p at 120Hz). The first game I tested was the recently released Resident Evil 2 remake, which has been lauded for its photorealistic visuals. Running on the EX3203R it looked every bit as impressive as it did on my TV, although the HDR component wasn’t quite as good looking as running the game in a pre-set gamer setting. When I switched the console’s refresh rate to 120Hz/1080p, the visuals, while still looking good, didn’t seem to perform any better (due to the Xbox One X’s 60fps cap). Given the intense nature of Just Cause 4’s gameplay and design, I decided to test it using the same above settings. I wanted to see the chaos in action at a higher refresh rate (albeit lower resolution) and the difference was noticeable, especially with lots of action on-screen. It was here I really appreciated the benefits of having access to higher refresh rates, as well as features like FreeSync 2 as the chaos more efficiently unfolded on-screen. When it came to the general computing the extra real estate was a huge boon, especially when using it for graphic design and video editing. Frequently I’ll watch ice hockey matches on my computer, and surprisingly the action looked smooth given the fast-paced nature of the sport. Movies also looked fluid and full of detail, with John Wick 2 and Avatar getting the call up for test duties (like I need an excuse to watch a Keanu Reeves film), with Avatar looking very schmick with the Cinema HDR setting enabled. However perhaps the biggest perk of the monitor for general computing was the BI+ tech. Just like using it for gaming, the automatic brightness adjustment felt like a godsend during long periods of screen time, especially at night. It definitely mitigated the tiredness that would kick in when working on a project long into the night. BenQ is no slouch when it comes to monitors. It’s a brand that is synonymous with computer monitors – gaming or otherwise – and while the EX3203R was better than any monitor I had used before, there’s still the all-important question of whether it’s worth the asking price, which in this case is $749 AUD. For most people, spending $749 on a computer monitor seems excessive. 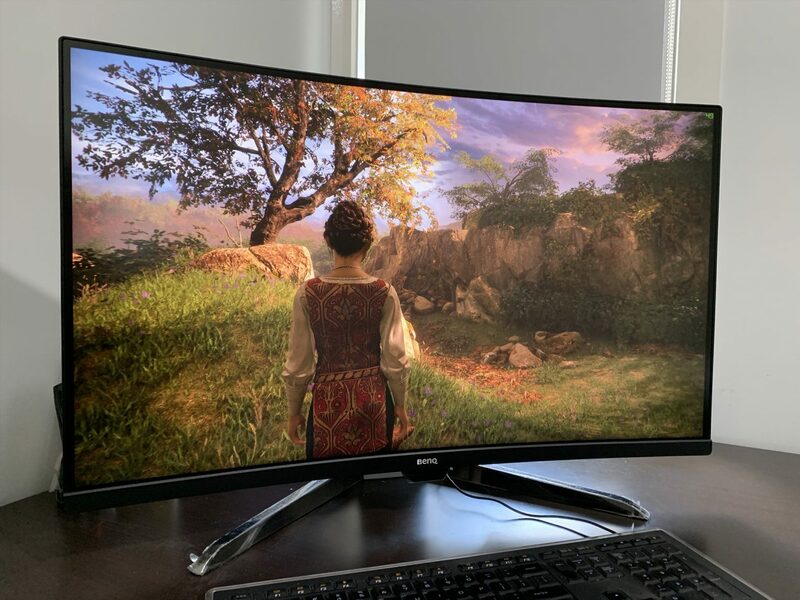 But when you consider it’s something I spend hours (some days up to 12+) every day staring at, a 32” curved gaming monitor with HDR10, BI+ tech, FreeSync 2 and 144Hz refresh rate for under $750 AUD is good value. The Brightness Intelligence Plus technology in particular was a game-changer for someone who has long sessions at their computer – gaming or otherwise. While it doesn’t do 4K, the image quality was superb, even with the brightness lowered. It may not be the Rolls Royce of gaming monitors, but if you’re looking for a big size monitor that has all the aforementioned features without breaking the bank too much, the BenQ EX3203R is hard to go past. A sample product was supplied by BenQ for the purpose of this review. For more information on BenQ visit their official website. If you want to grab yourself a BenQ EX3203R curved gaming monitor, Australian-based consumers can find it at one of the following retailers: Amazon Australia, MWave, Scorptec, JB HI-FI. International consumers: Amazon US, Amazon UK.